I love coincidences and synchronicity. I've just come across one of my old forgotten notebooks from 2006. In it I'd written down some ideas and made rough sketches for paintings and other creative projects that I wanted to do. One of the ideas was to do paintings of the SEVEN Chakras, each one in the colour associated with that Chakra. And what do you know!!! We recently did exactly that in my process art classes! SEVEN years later!! "Colour is a form of energy that has the power to affect us physically, emotionally and mentally. Our use of colour expresses how we feel and think. The colours we surround ourselves with can have a huge effect on our mood. Colour can raise spirits and self-esteem, enhance surroundings, reduce stress and help view life more positively. 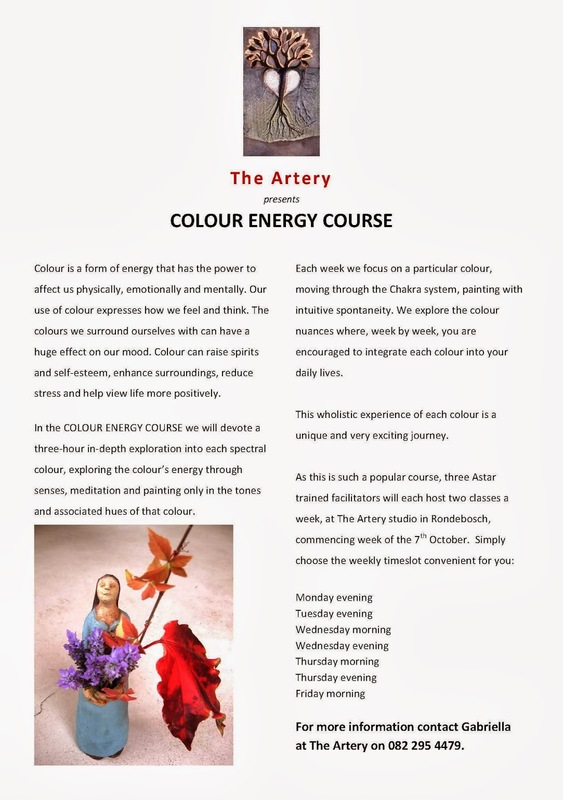 In the Colour Energy Course we will devote a three-hour in-depth exploration into each spectral colour, exploring the colour's energy through senses, meditation and painting only in the tones and associated hues of that colour. Each week we focus on a particular colour, moving through the Chakra system, painting with intuitive spontaneity. We explore the colour nuances where, week by week, you are encouraged to integrate each colour into your daily lives. This wholistic experience of each colour is a unique and very exciting journey." I did the ASTAR Colour Energy Course at the end of last year (2013). 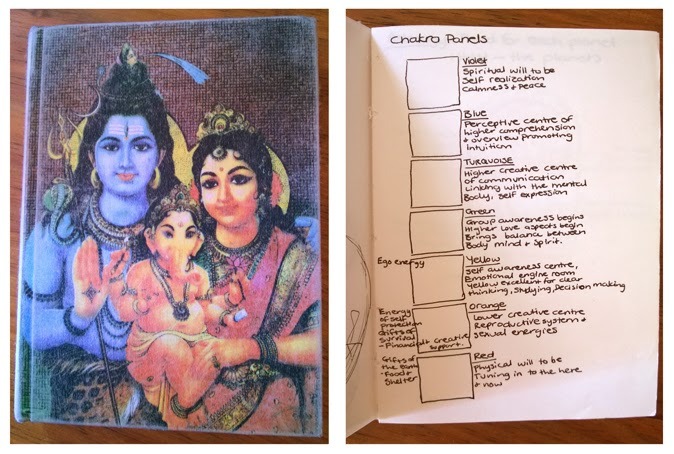 I was very excited to take part in the course because I'd had an interest in colour energy and the chakra system in the past and was keen to find out more. The course helped me to reconnected with a part of myself that I seemed to have left behind somewhere along the way. Our home used to be filled with colour, but it was also full of clutter. In an attempt to de-clutter our space and to make it less busy I replaced colour with, what I thought would be, calming neutrals and a lot of white. There was also a trend at the time to have All White, minimalist interiors. I never got the minimalist thing right. My hubbie and I just collect too much STUFF! Doing the course has made me fall in love with colour all over again. Even colours that I was not keen on before, like yellow and purple, now excite and inspire me. The course also ended up being more profound than I'd ever imagined it would be. All in all, I LOVED it!